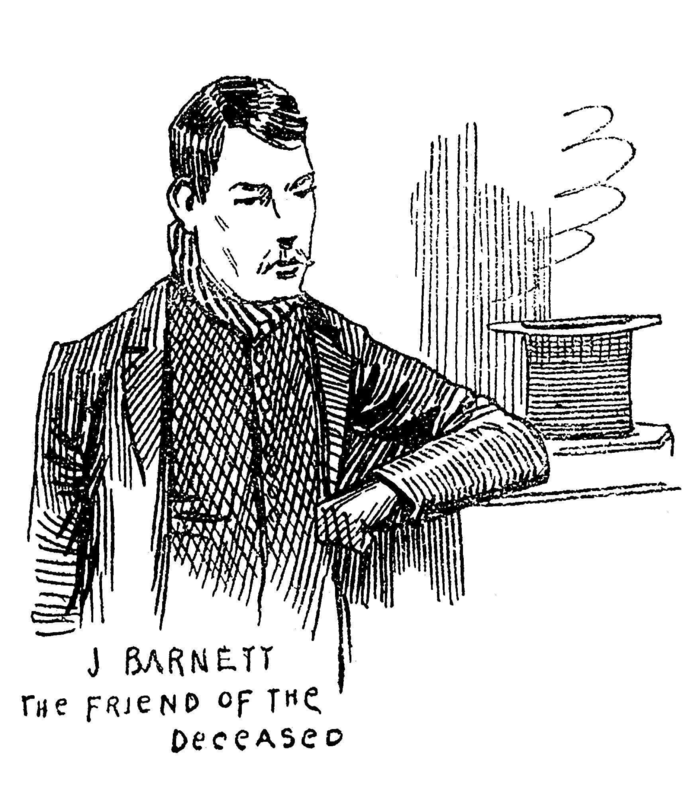 Joseph Barnett was the one-time boyfriend of Ripper victim Mary Jane Kelly. He is the only suspect who is known to have a direct link with one of the victims. Born on 25th May 1858 at 4 Hairbrain Court, Whitechapel, Barnett’s parents were John and Catherine Barnett who had originally moved from Ireland to settle in Britain, where John took up work offloading ships by the London docks. Some years later, John would become a licensed fish porter in Billingsgate Market. By 1871, Joseph Barnett followed in his father’s footsteps and gained his fish porter licence. Joseph was also registered on the census as living at number 4 Osborn Street, in the heart of what later became known as Jack the Ripper’s stomping ground. On Good Friday, April 8th 1887, Joseph Barnett met Mary Jane Kelly in a pub on Commercial Street. Kelly had been working as a prostitute in a brothel in France and had recently moved back to Spitalfields. On the night they met, they drank together, becoming closer over the course of the evening, and agreed to meet again the following day. When they met for a second time, they decided to remain together, and Barnett acquired lodgings for them both on George Street. Over time, their lodgings changed multiple times to Little Paternoster Row and Dorset Street, but they were continually evicted for non-payment of rent and drunkenness. It might seem as if they moved in together quickly, and it’s unknown what Kelly was doing for money at the time, but if her past career was accurate, then it’s difficult to see how that would have changed by moving to the East End. So, there is little doubt that Barnett had probably paid for his first encounter with the woman and repeated the process the next day. Perhaps he took a shine to her and promised to take her away from her horrible life. In his own way, he probably felt he was saving her from the streets. Kelly likely thought herself extremely lucky she had found a man with a steady income, willing to pay for her to live. Whether she really cared for him or not is impossible to know. Whatever the circumstances may have been, the couple stayed together and in March 1888, they had begun living at 13 Miller’s Court, Dorset Street. The accommodation was small, made up of a single room that was sparsely furnished and owned by a landlord named John McCarthy who asked for a rent of four shillings and sixpence per week. Here they would stay for the next eight months. During this time, Kelly didn’t get to know many people and it would seem that very little was known of her. It appears she kept to herself and the only time she came out of her shell was whilst drinking. Somewhere between July and August 1888, Joseph Barnett lost his fish porter licence. It’s not known why this happened and there has been much speculation as to the reasons, namely, theft, drunkenness or simply being laid off. Either way, money stopped entering the home. In this situation, unsurprisingly, the relationship deteriorated with the couple arguing and becoming violent towards each other. At some point, Mary decided it was time to go back to prostitution, likely as a response to Barnett losing his job as this would have undoubtedly led to them being back out on the streets. According to some witness reports, Barnett would never allow Mary to go back to a life of prostitution, suggesting that this was probably the main cause of their arguments. Jealousy, anger and resentment must have tortured Barnett. The feeling of being inadequate, and the very real prospect of your attractive girlfriend being in the arms of countless other men, must have affected him. But it seems there wasn’t much he could do about it. Did Mary Jane Kelly Fit the Pattern of Victims? Kelly was different from the other victims of Jack the Ripper as she was the only prostitute with her own accommodation and a place where she could potentially bring clients. After all, it would be a lot more comfortable than performing sexual services out on the cold streets. From what we know about Mary Kelly, the evidence suggests that she did bring men back to the room. She also let prostitutes use her room as well, leading to more arguments. We know that on one occasion, a fight between the two led to Kelly throwing something at Barnett, breaking their window, and on that occasion, he moved out. However, it’s extremely unlikely that Barnett would have stayed in the same small room and, more importantly, the same bed, during all the other previous arguments and fights. Like most men in his position, he would most likely have angrily stormed off to drink his sorrows or just sleep elsewhere until it all cooled down. He also stated that Kelly was in the habit of bringing other women back to stay the night in 13 Millers Court, out of sympathy for them. This suggests that during late July and early August 1888, Joseph Barnett was effectively being kicked out to the streets during the time Kelly would be working. This also coincides with the start of the Jack the Ripper murders, which many historians believe started with the murder of Martha Tabram on 7th August 1888. Was it possible that the killer was, in fact, Joseph Barnett seeking revenge on the women who had ruined his relationship and his comfortable life with Kelly? Were the murders Barnett’s attempt at keeping Mary Kelly off the streets? If this was the case then it doesn’t seem to have worked. Kelly continued to sell herself over the next couple of months and the Ripper murders didn’t put her off. On the night before she died, Joseph Barnett went to visit Kelly in her room at Millers Court. We don’t know what was said but many believe that Barnett may have been pleading with her to take him back. 11 hours later, the landlord, John McCarthy sent a man named Thomas Bowyer to collect the huge amount of rent owed by Mary. Upon knocking on the door and receiving no reply, Bowyer decided to go around and look through the windows. Noticing the broken pane of glass, he reached through and moved the curtain aside, revealing the brutally mutilated body of Mary Kelly. The existing photograph doesn’t really convey the sheer horror that would have been etched on the faces of all who saw it. Could Joseph Barnett have been Jack the Ripper? According to the FBI, the Ripper would have been a Caucasian male between 26 and 38 years of age. He would have been a local, familiar to the area and working in Whitechapel. Joseph Barnett was 30 years old, white, and had been living within a mile of Whitechapel and Spitalfields all his life. The Ripper would have had an absent father figure in early childhood. When Barnett was six, his father died. The Ripper likely had some sort of physical defect which would be a source of great frustration, anger or resentment. According to one contemporary news report, Barnett often repeated the last words spoken to him. This may have been an indication of echolalia, a speech impediment which he may have suffered from his whole life. The Ripper likely had a job that allowed him to express his destructive tendencies. Barnett held a job as a fish porter, where he would have spent much of his time gutting the fish. Barnett also matches some of the eyewitness descriptions of the killer – 5ft 8 inches, fair hair and featuring a moustache. After the murder of Mary Kelly, Jack the Ripper seems to have suddenly stopped killing – yet nobody knows why. According to criminal experts, the Ripper likely stopped killing for one of two reasons: either he was arrested and detained for another crime or feared he would be caught and discovered if he continued his murderous spree. Interestingly, Barnett was interviewed by the police for between 2 and 4 hours after the Kelly murder (reports vary). If it was 4 hours, then it would suggest they were not satisfied with him completely and may have come close to breaking him. We simply don’t know. If he was the Ripper, then another reason for stopping would be because the source of his anger had been removed with the murder of Kelly and it would explain why he no longer felt the need to go out and kill. Barnett’s life after the Kelly murder remains a mystery until 1906 when he was given a new porter’s licence at Billingsgate. After this, he is recorded as dying on 29th November 1926, aged 68. The cause of death was reported as bronchitis and oedema of the lungs. Do you think Joseph Barnett could have been Jack the Ripper? Find out more about Barnett and other notable Ripper suspects on the Jack the Ripper tour! Book your place today.